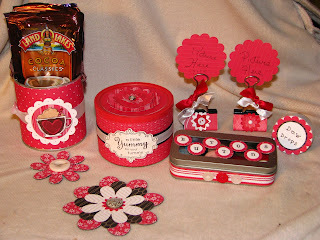 I thought today I would share with you a little gift set that I created for a friend of mine. Includes a cocoa holder, chocolate holder, picture holder, magnets, and a altered tin for buttons. Its funny now how over the last several years how a plastic or tin container cannot be thrown out or recycled without it be thoroughly thought over it if could be altered into something great or not to bother, LOL .